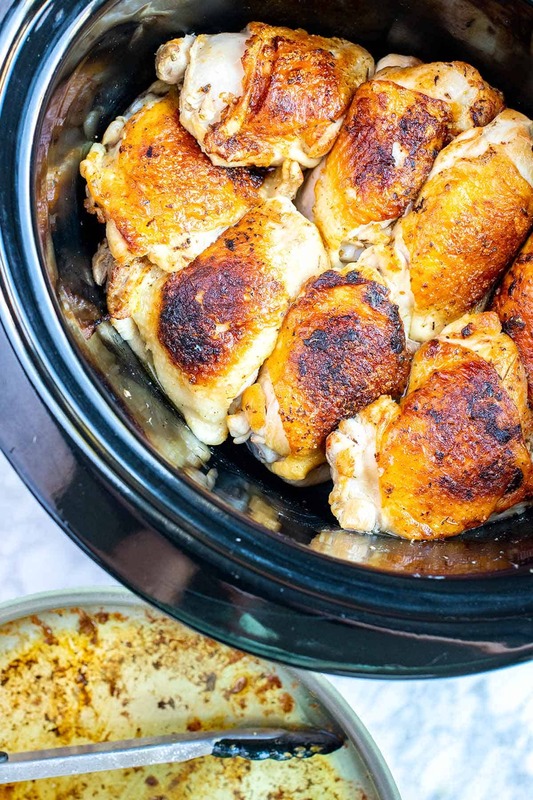 This is our favorite slow cooker chicken recipe! See how we make ultra tender lemon chicken in our slow cooker with a lemony chicken gravy. So delicious and thanks to a crock pot, most of the time for this recipe is hands-off! 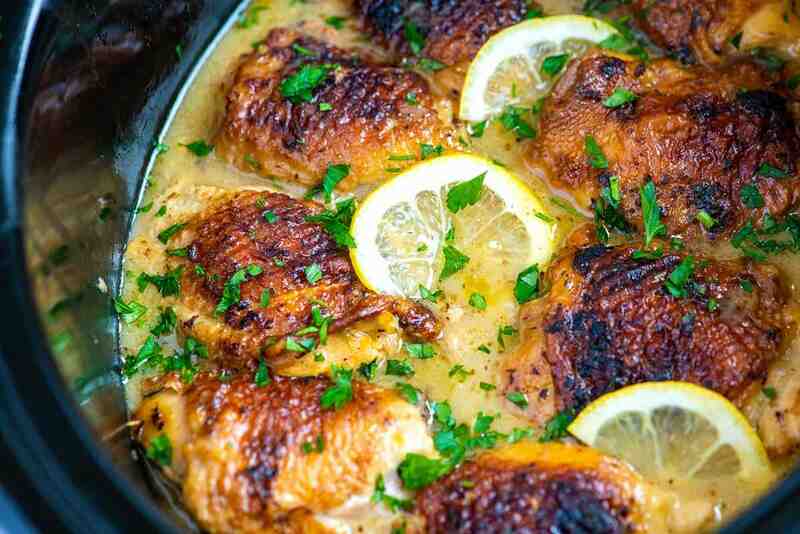 Jump to the Ultimate Slow Cooker Lemon Chicken Thighs Recipe or read on to see our tips for making it. 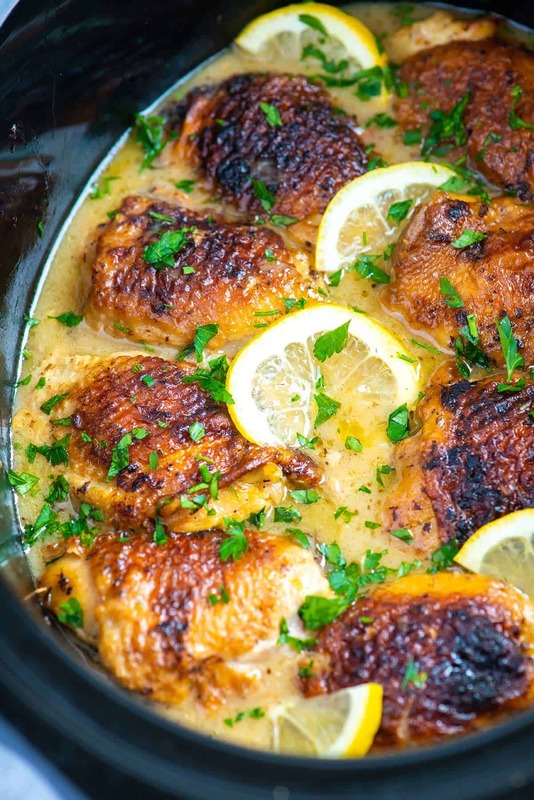 Quite a few years ago, we shared our original lemon chicken recipe. In that recipe, we brown chicken thighs on the stove, and then finish them in the oven. This recipe takes our original with all the herby lemony goodness and adapts it for the slow cooker. 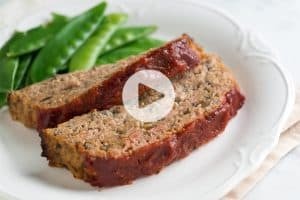 The first time we made this recipe, I knew it would taste good, but I honestly didn’t know that it was going to be as tender or as mouth-watering. The slow cooker does magical things to chicken thighs. 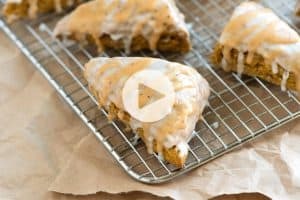 Let’s walk through how to make them. First off, let’s talk about what happens to skin-on chicken thighs when they are cooked in a slow cooker. Many crock pot chicken recipes call for adding extra liquid into the pot, but you don’t need to do that. 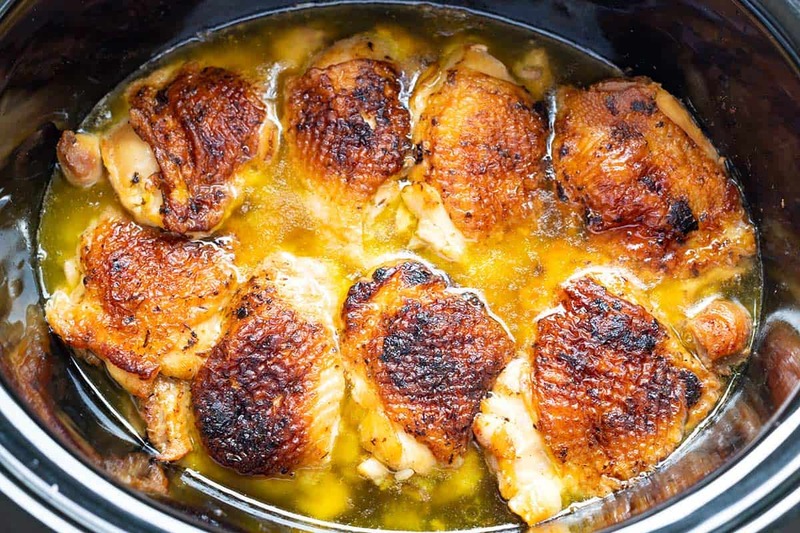 To make the best chicken thighs in a slow cooker, all you need to do is place chicken thighs directly into the cooker, season with salt, and cover with a lid. As the slow cooker heats up, the fat from the skin renders and falls down over the chicken. The chicken literally cooks in it’s own juices and fat. Now, let me back up. You can just place the chicken thighs into the cooker, but for an even better result, I prefer to add some extra flavor with herbs and lemon zest, and then brown the skin in a skillet. This adds a bit of color to the chicken, which looks much better in the end. Then since I’ve dirtied the skillet, I use it to make a delicious lemony gravy to serve with the chicken when they are done cooking. For the best slow cooker chicken thighs, brown the skin in a skillet first, and then add to the slow cooker. No additional liquid is required. In the photo below, I’m showing how the chicken looks after 5 hours of cooking. See all that liquid in the bottom? That’s pure gold. It’s a rich chicken broth that’s absolutely delicious stirred into our lemon gravy or simply spooned over the chicken. Just skim most of the fat from the top and you are all set. I’m not sure I can even convey how tender the chicken turns out. It’s making my mouth water just looking at that photo. Here’s what the chicken thighs look like after 5 hours of cooking in the slow cooker. They are so unbelievably tender! We impart lemony flavor into this chicken in two ways. The first way is to rub the chicken with a combination of mustard, lemon zest, herbs, and salt. After seasoning the chicken, I sear the chicken skin in a hot skillet until browned. As I mentioned above, the searing step is not 100% necessary, but it ensures browned, delicious chicken skin when the chicken is done cooking. It also gives us the perfect opportunity to make a flavorful gravy right in the skillet. The lemon gravy is optional, but wow is it tasty. It’s easy and made directly in the pan used to sear the chicken in. By using the same pan, you get to scrape up any browned bits of chicken that got stuck on the bottom, which adds extra flavor. To make the gravy, we whisk some of the rendered fat from searing the chicken with flour. Once the fat and flour has had a chance to cook for a minute, I pour in chicken stock and lemon juice. Then I cook the gravy until it thickens slightly. It takes a minute or two, tops. (By the way, this is exactly how we make regular gravy). And that’s it. Mouth-watering, tender, ultra-flavorful chicken thighs made in your slow cooker. It’s honestly one of the best chicken recipes we’ve shared. Ultimate Slow Cooker Pulled Pork — This delicious pulled pork is perfect for sandwiches, salads, and tacos. These Tomato Basil Slow Cooker Chicken Meatballs are lean and so simple to make. Have you ever had bone broth? Our Slow Cooker Bone Broth is incredibly delicious and can be made right in your slow cooker. The slow cooker makes amazing shredded chicken. Here’s our recipe for Tender Slow Cooker Shredded Chicken. This is our favorite slow cooker chicken recipe! See how we make ultra tender lemon chicken in our slow cooker with a lemony chicken gravy. So delicious and thanks to a crock pot, most of the time for this recipe is hands-off! We make a simple lemony gravy for the chicken. This happens in the same skillet the chicken is browned in before being added to the slow cooker and saved for when the chicken is done cooking. At the end of cooking, there will be just over 2 cups of chicken broth in the bottom of the slow cooker — some of this is rendered fat, which we prefer to remove. After skimming most of the fat from the broth, you are left with a flavorful chicken broth. For serving, combine this broth with the lemon gravy. It’s delicious. Add as many chicken pieces (thighs or breast) that will fit in one layer at the bottom of your slow cooker. They can be quite snug — as they cook, they reduce in size. Make rub for chicken. Combine mustard, 1 teaspoon of the lemon zest, oregano, thyme, 1/4 teaspoon of salt and 2 teaspoons of the olive oil in a small bowl. Use fingers or a brush to coat chicken on both sides with the mustard rub. In another bowl or measuring jug, combine remaining lemon zest (2 teaspoons), lemon juice and the chicken stock. Set aside. Note: Both the chicken and lemon-chicken stock mixture can be prepared up to one day in advance. Cover both and keep in the refrigerator. Heat remaining teaspoon of oil in a large oven-safe skillet or frying pan over medium heat. Add the chicken, skin-side down, and cook 3 to 5 minutes or until the skin has turned golden brown and some fat has rendered. Transfer the browned chicken to a slow cooker and arrange in one layer with the skin facing up. Cover with lid then cook on LOW for 5 to 6 hours or until the chicken is cooked through. Save the skillet with drippings for making the sauce. Remove all but 2 tablespoons of fat from the skillet used to brown the chicken. If there is not enough fat, add butter so that 2 tablespoons of fat are in the pan. Place over medium heat until hot then whisk in the flour. Continue to whisk until the flour and fat turn into a smooth paste and look medium blonde in color; about 1 minute. Pour in the lemon juice-stock mixture and whisk until smooth. Bring the sauce to a low simmer. As it simmers, it thickens and becomes glossy. Transfer to a jar or measuring jug and refrigerate for when the chicken is cooked. When the chicken is done, it will be sitting in an inch or so of cooking liquid and rendered fat. Transfer the chicken to a plate then skim as much fat from the liquid as possible. There should be almost 2 cups of liquid left in the slow cooker. Warm the lemon gravy made earlier then add the lemon gravy and stir until blended. Place the chicken thighs back into the slow cooker for serving or serve with the gravy drizzled on top. Can I use chicken breasts? Absolutely. If you can find them, use skin-on chicken breasts since it keeps the chicken very tender and adds flavor while it cooks. Skip the lemon sauce: If you are short on time, you can skip the lemon sauce. 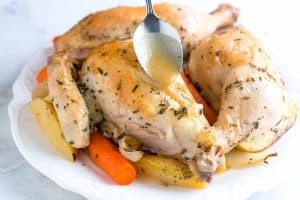 The chicken broth that is made in the slow cooker after cooking the chicken over 5 hours is absolutely delicious and works very nicely spooned over the chicken or any sides you plan to serve it with. 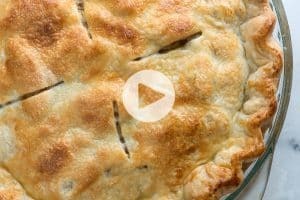 I made this and it became a favourite – thank you for the great recipe! Making this right now! Smells divine! Thank you! I made this recipe for the first time a few months ago using boneless, skinless chicken thighs. My family fell in love at first mouth full! It has now become a weekly must for dinner, we all crave it. So easy to make. Yum! Divine! I have boneless, skinless thighs, making this now. I assume i should still do the browning? And will they cook more quickly than bone-in? Thanks! Hi Ellen, boneless skinless thighs will work nicely. The cook time will be similar, although you might find they finish cooking a little earlier. I’d still brown them — the extra step will add some nice color and flavor. This reciple is just what I’ve been looking for. Just checking… The directions say arrange the chicken skin-side-up in a single layer and then put the lid on. Is there no liquid in the slow cooker? The “after” photo looks like there’s some liquid in there. Thanks again for the great ideas. Hi Ian, There isn’t liquid in the slow cooker before you cook the chicken. The liquid is generated by the cooking process. It’s delicious! Brilliant! Thanks for your quick reply! Looking forward to making this one.